The Chase competition runs during the late afternoon / early evening gameshow on ITV, there are some special “one off” shows and there are many times when The Chase operates without any viewer competition at all. 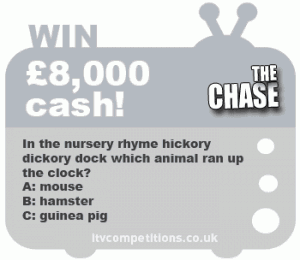 Some people find The Chase a little boring in comparison to other cheesy gimmick gameshows, however there are also those who love it as the contest allows them to test their intelligence and general knowledge as they race to beat the Chaser. 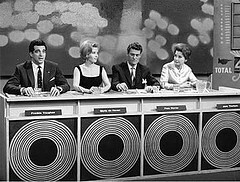 Unlike games of chance such as Deal or No Deal & Red or Black, The Chase competition allows viewers at home to test their minds, by attempting to answer the questions alongside the TV contestants; similar to Who Wants To Be A Millionaire or Mastermind. It is always amazing how knowledgeable “The Chaser” is; rarely answering a question incorrectly in any round, although over recent shows they have been a little slack! The most recent Chase competitions will be posted below along with a few others. You can also view all TV competitions by clicking here. There have not been many viewer competitions recently, with ITV comps running on The Tipping Point and Tenable instead, however they might bring it back – who knows?! Meanwhile, we’ve listed a few recent comps below. So to enter The Chase competition as a viewer, you just needed to answer general knowledge questions that are much easier to answer than those which feature on the Chase TV show. You needed to watch the television show to hear the question/answer options and then submit your A, B or C answer via telephone, text message or the itv.com competitions website. If you enter online at itv com your entry will be free; text and phonecalls cost more than £1 each. Please note that ITV have now updated how they run their viewer competitions and this information has now changed. The Chase launched in 2009 and has been a popular, steady-player for ITV ever since. The solid “general knowledge” format without gimmicks makes a low-profile player with longevity; set to stand the test of time. Contestants operate as a team, quickly answering questions to build up a kitty of cash in the prize pot. They are then put up against “The Chaser” whereby they are literally chased, with the Chaser gaining on them every time a question is answered incorrectly by the contestant & correctly by the chaser. The final part of The Chase competition brings all remaining players together to jointly answer questions as the chaser hopes to catch them. The biggest prize won was £100,000 in a celebrity edition (split between 4 contestants) and £50,000 in a regular edition (split between 2 contestants). As a final note, the weakest Chase competition player was Keith Newbery who never answered one question correctly nor banked any money (he would probably have been better off on Deal or No Deal lol!). You can read more in the wiki.